It seems like Mark Wahlberg has been slowly building himself a career that involves him being typecast into the role of the down-on-his-luck, working-class maybe ex-cop character, thrust in a web of double-crossing and framing that’s just too much for his simple Joe-six-pack (recovering) self. In a universe that seems to always be Boston, where characters are always in the midst of the old Hollywood cliché of Irish catholic or Italian (or in this case Latino) communities, there isn't much place for straying from the formula. And formulaic it is, complete with political scandal, financial fraud and “they want to take what little you have that you worked for so hard all your life” mentality. I won’t say it’s not a great fun to watch, considering the expectations. 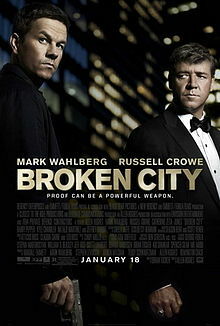 Performances are solid both from the main cast and the supporting characters, and if you like the kind of movies that Wahlberg has been pumping out (you know the kind, Four Brothers, We Own the Night, Contraband and even The Town, which I was surprised to find out didn't include Wahlberg), you’re sure to also enjoy this one. He even has a new one coming out, Pain & Gain, which is a little stray from the formula, and is a Michael Bay project, with all that that implies, but in the end, there is still a heist and Wahlberg’s lovable loser. Definitely a fun watch.